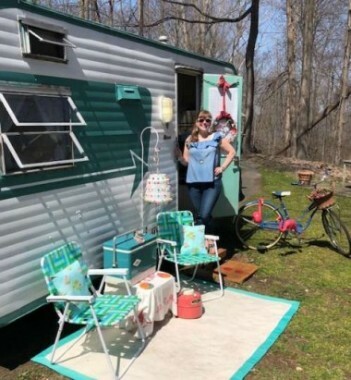 Last summer, my family found our “dream-come-true” vintage camper- a 1966 Skyline “Nomad”, that we christened “Gidget” (thanks to dear readers who helped with a name in last year’s blog). We were so happy and worked hard to get ready to debut her at our first “Vintage Camper Rally” last August. We’ve certainly learned a lot since then, and one year later, the decor’s finished! Come take a tour and see the transformation! Unfortunately, we haven’t been able to go camping again since last year, but we enjoy spending time at home in the camper (except for winter, when she’s winterized and put away). We drink coffee, eat dinner under the stars, and spend time “vegging” – often in the driveway! 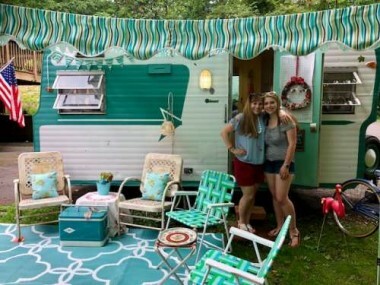 We love hanging out together and with friends in our little glamper (of course, we also LOVE camping)! 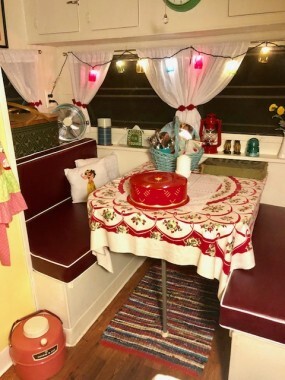 There’s many ways to restore and decorate campers; we decided to go as original and “vintage” as possible with period accessories to match. Last summer, we painted the walls and cabinets to preserve the wood and brighten the interior. There were lots of details to tend to – plumbing, checking gas lines, and replacing things like missing lights and a broken closet shelf. 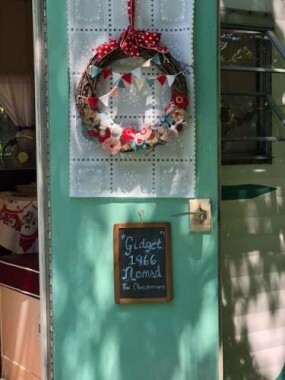 With a vintage camper, there’s also plenty of FUN stuff to do – decorating and making a cozy place to spend time! 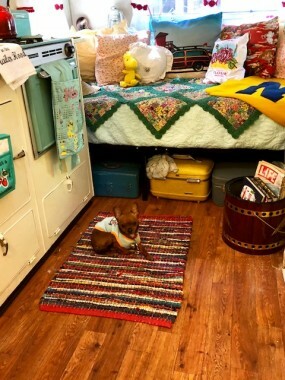 It looked cute even a month later, but now it’s been a year, and Gidget’s transformed! 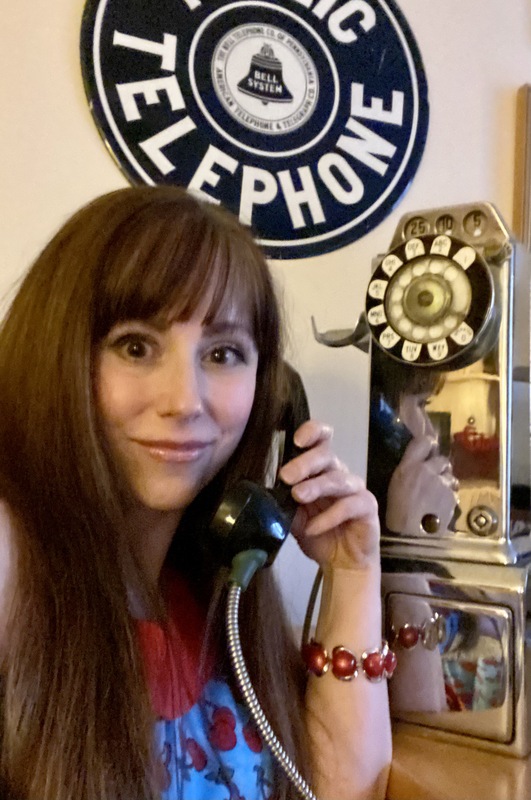 Outside it’s 2018, but inside, it’s 1960-something! Vintage linens, a milk-glass fairy light (with battery operated candle only) and vintage Bingo make for cozy camping evenings. Owls were a popular camping theme back in the day. These were a “housewarming gift” for Gidget from a friend. At last year’s rally, I was smitten by another camper’s light-up vintage coffee maker. 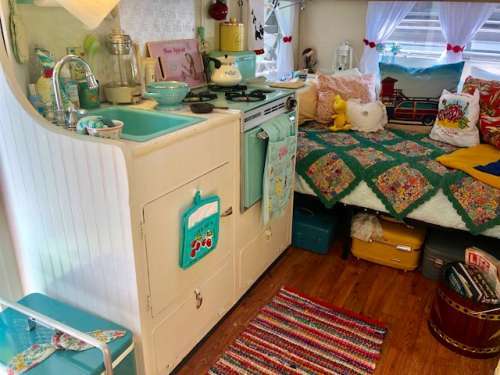 I love the “atomic starburst” pattern of mine, matching the camper’s all-original laminate countertop. From the 60’s, it still makes piping hot coffee. If you buy one online, ask the seller if it perks coffee, not just if it “works”. Two lights should go on while perking, one should go off when the coffee is ready. Outdoors, we’ve added an awning and bunting, purchased from Pink Flamingo Awnings. Awning rails were already in place, so attaching the awning is a snap! Hobby Lobby carries pink flamingoes made from the original Don Featherstone molds. 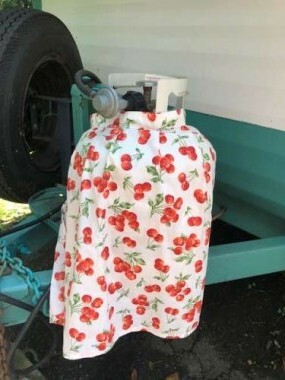 I love MaryJane’s idea of covering the propane tank with a vintage apron! 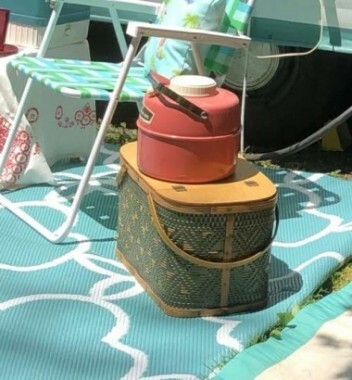 An outdoor rug, a vintage “lawn light” and other vintage camping items like a matching aqua cooler create a relaxing outdoor retreat. 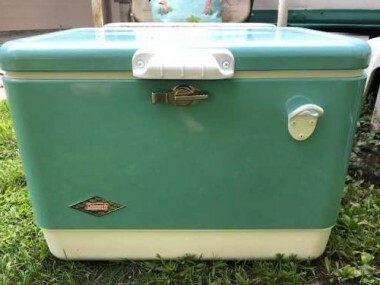 (If you can’t find a vintage cooler, Coleman makes a very cute “retro” model). 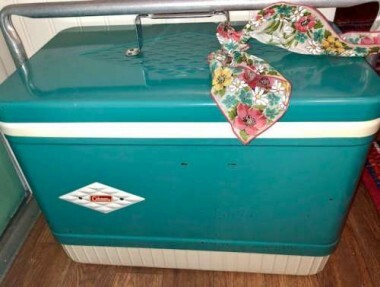 This large, 54 quart, retro cooler is available from Coleman. It matches my vintage 1960’s find. With my daughter this summer when we were hostessing a Fourth of July picnic at home. This spring, I found vintage “motel” chairs on a tag sale, cheap! I just need to sand them and will prime and repaint glossy white. Super heavy, they stay at home; for camping we use lightweight, retro-style webbed lawn chairs from Target. My friend Andrea gave me a vintage camping stool that was hers as a child. Its colors match and it serves as a great occasional table when topped with a tray. 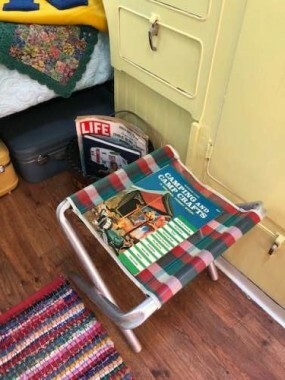 The 1960’s camper book was 25 cents and is a hoot to read! 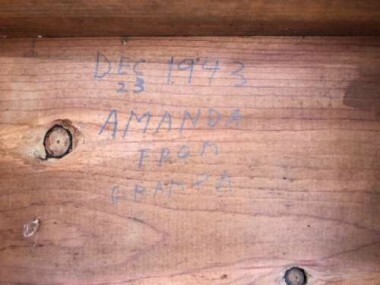 Our original camper steps aren’t usable (yet) but a sweet 1940’s stool is charming instead. To display the model, year and our name, I used a child size antique chalkboard, attached to the door with Gorilla tape and small 3M hooks purchased from our local hardware store. These work great for a variety of things, indoors and out, and because they’re clear don’t “show”. Outside, we applied them to the door for a wreath and our bunting; inside we’ve used them to hang large kitchen utensils in the pantry and for wall decor. It’s a great way to keep from nailing into walls; just make sure you’re using the right strength hook and tape for your items. 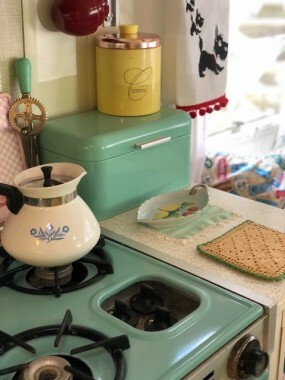 We painted the inside door to match the kitchen’s sink and stove, all original 60’s turquoise. I believe in comfort, so we bought a new bed and memory foam mattress last year, which also serves as a daybed and had custom cushions made for the dinette which becomes a bed as well. I love how vintage linens bring all the colors together! I had so much fun sewing up all the throw pillows you see. Vintage linens and lots of throw pillows make a comfy spot. A pristine 60’s portable grill, too cute to use as intended, is repurposed as a magazine/book rack. A vintage tool box holds tools, while vintage luggage makes for storage and cute decor. All is “Pipsqueak” approved. The dinette folds down to become a double bed. Memory foam cushions are comfy! 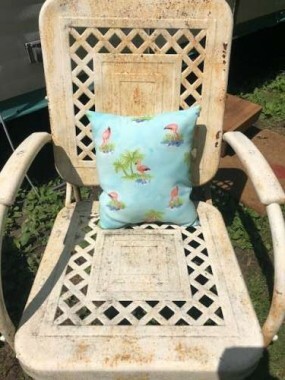 I purchased marine grade vinyl for the cushions from Joann Fabric. A nod to the “flamingo” camping theme of days gone by is found in the glass flamingo statue from the 50s. I found mine in a church thrift sale for $2.00. 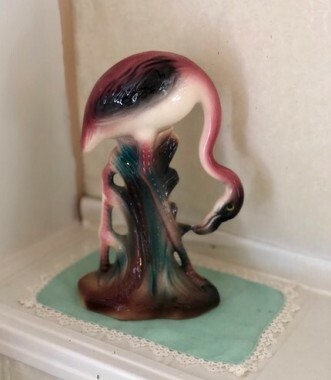 Similar ones can be found on Ebay and Etsy, and TJ Maxx and Homegoods have modern, small flamingo figurines each summer for around $6.00. 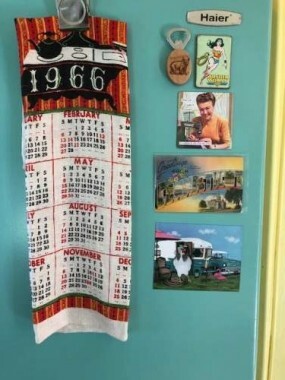 Displaying the camper year and our home state on the fridge are a vintage calendar tea towel and antique linen “Connecticut” post card. It took awhile to find a vintage “Greetings from Connecticut” postcard. All the magnets on the fridge are gifts from friends, including the hilarious “chicken art” glamper magnet. 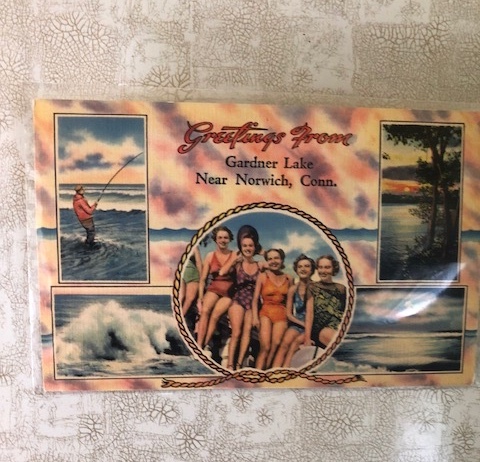 I also used a vintage postcard in the bathroom to disguise a flaw in the original wall. 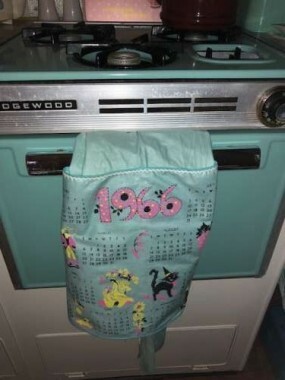 At the Country Living Fair in Rhinebeck, New York this year, I stumbled across a mint-condition calendar apron in camper colors (doin’ a happy dance)! 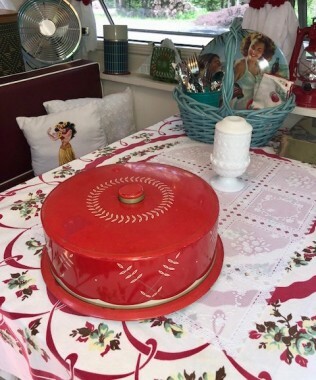 A vintage cake tin sits on the table. The hula girl pillow was made by me from a vintage dishtowel. 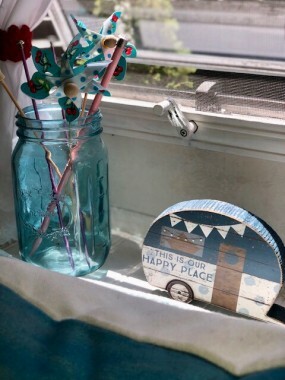 Other tins like a TJ Maxx bread box and a 60’s vintage coffee tin brighten the kitchen. 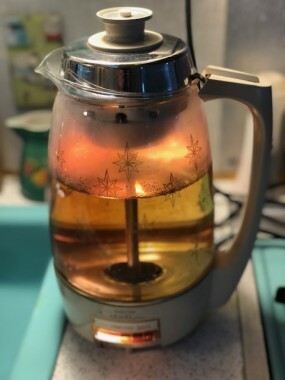 The Pyrex kettle belonged to my best friend’s mom, from when my bff was a child. The bathroom is now done! We found that showers at the campsites are nice, so we decided not to reinstall the shower that was original to the camper. (Hot water and steam don’t sound like a great combo inside. If needed, a portable shower can be used inside or out in a pinch, which charges using USB)! However, I’m thankful for a potty, especially in the middle of the night! I pulled up the flooring found in the rest of the camper down to the “original” pearly flooring in the bathroom. Lots of scrubbing and the bathroom gleams to back to its 1966 original glory. I decided to go with a kitschy vintage flamingo theme. 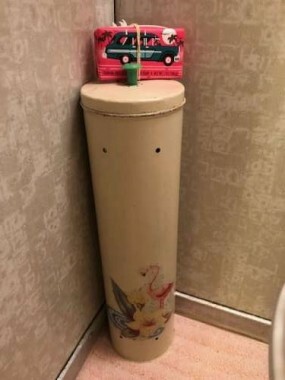 A vintage toleware toilet paper holder inspired the bathroom’s flamingo theme. 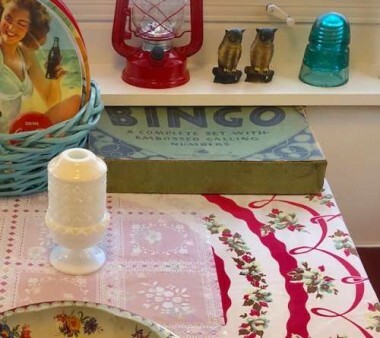 A vintage Hawkeye picnic basket offers charm, and storage. I love the teal color of this one, complete with cheery yellow divided dishes. This large vintage picnic basket is made by Hawkeye. Redmond is another brand that made similar baskets. Inside the camper, it makes great storage, while outside it looks cute and can serve as an outdoor “end table”. 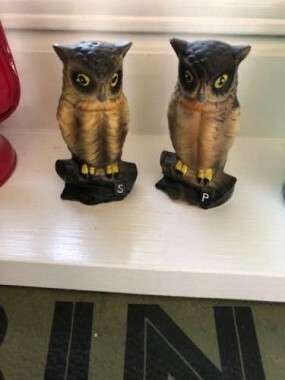 I found mine “in the wild’ but similar ones can be found on Ebay and Etsy. My family and I love our little camper so much. I also love the “friends” represented inside: gifts from dear friends that fill my camper: MaryJane, Andrea, Julie, Val, Rose, Rachel, CeeJay, Linda, Erin…I think of you all every time I step inside! Of course, it’s not all fun. 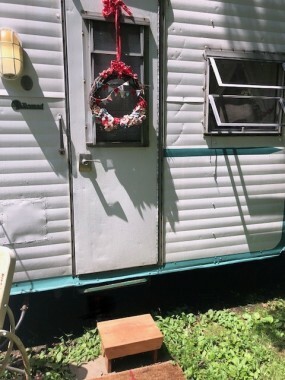 Like owning an antique house, maintaining a vintage camper brings work and expense. She’ll always need something done to her to keep in shape. 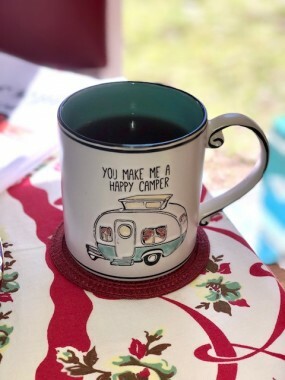 A labor of love, the camper is truly our “happy place”. 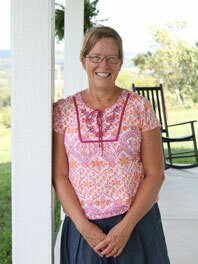 Thank you, MaryJane, for inspiring me to be a vintage-glamping farmgirl! Hope you enjoyed our tour; remember to leave me a comment so I know you stopped by! ← Gone to the Beach! You all have done a great job! Gidget is adorable! What a great job. The vintage is to perfection. I love all the vintage. Enjoy. 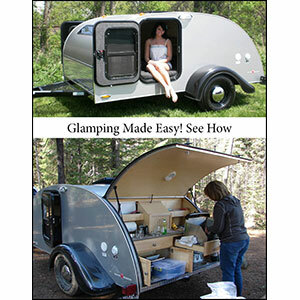 You have created the camper I am hopeful to get. what an awesome job! Now all you need is your little Featherweight. Adorable. LOVE your redo. 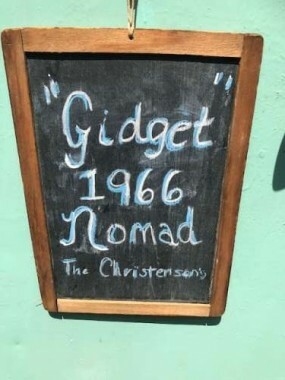 We had a Nomad about the size of yours. It was very convenient and we really enjoyed it with our two girls. 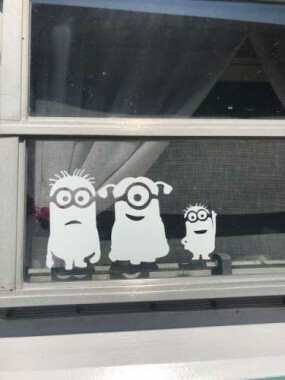 I like your decorations. I even recognize some of them from when I was growing up. Sure is fun to see them again. 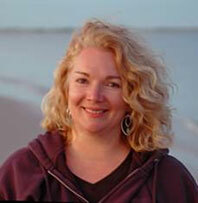 You did a fantastic job on Gidget! I just love everything. Love seeing what you have done with this camper. 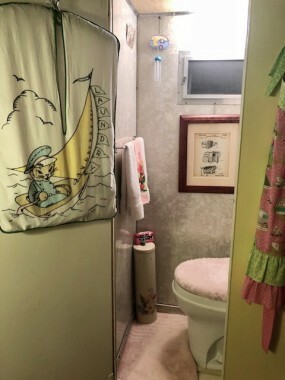 My family had a similar one back in the 1970’s, although we didn’t have a bathroom in it. Hope you get to go camping with her, but having her in your backyard is so much fun, you don’t really have to trade anywhere! 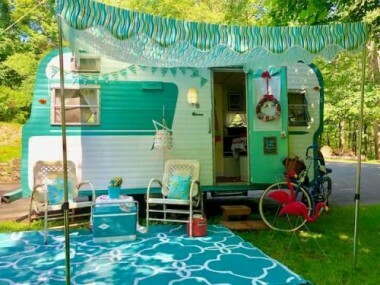 I LOVE the vintage camper! You have done an excellent job, and at low prices too! 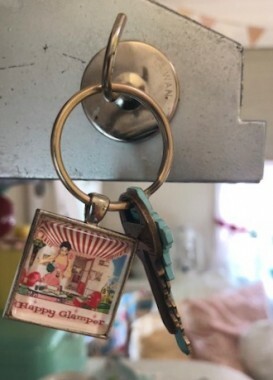 What a fabulous glamper! Love all the vintage acoutrements and the vintage green! Hope you make many happy memories in your beautiful place. Congratulations! Love the turquoise ! 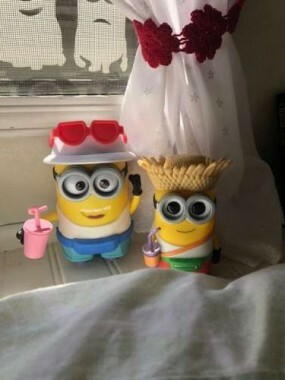 Everything looks just fabulous! It’s like a step into the past! Great job! I love it!! She so cute. I have a 63 Scottsman that I am restoring. I still have a ways to go but I’m loving it. 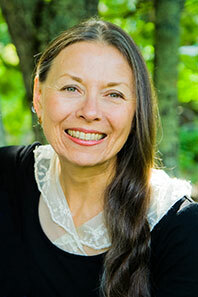 You can see my pics on my Facebook page Strange Art & Vintage Finds w/ Mary Jane. I named her Mary Jane after my favorite author and the man I bought it from was a pot head lol. I saved her. Hugs!! Splendid! I drove past a used car lot down the street one day and saw a vintage Shasta on the lot for $3,000. I went back the next day to check it out with the idea of revamping it to it’s original state and the price had gone up to $13,000. It was not meant to be. I love it all!!!! But my favorite just might be the beautiful stove! Thanks for the trip down memory lane, girlie! Your ‘Gidget’ and cute pipsqueak are Adorbs! 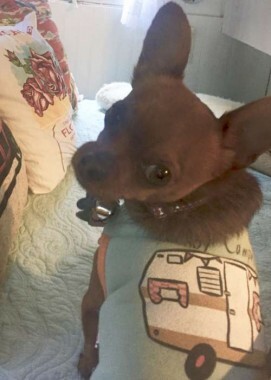 Nicole, I really enjoyed reading your post, as always, but summer is almost over, and autumn is just around the corner, and I am still looking for a camper or motor home for our use and to travel to NYS to see my brother and his family there. Would love to go glamping too, but so many obstacles in the way right now. Hopefully there will be one this fall or winter available for sale in our price range. I love Gidget. She is so cute. Back in the day when I was young and my parents would spend all summer at Yosemite camping out in tents. It was a blast too. I love the memories. 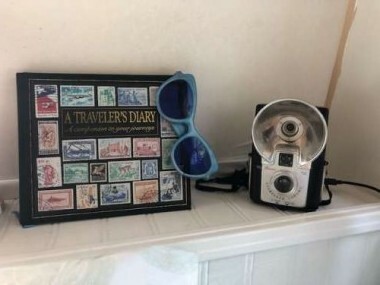 I was thrown back in my mind to happier times when my grandparents were still living and nearby with those vintage hotel chairs in their backyard painted in bright, happy colors that strangely matched Momma’s Fiestaware dishes. Hmmm, Don’t think that was a coincidence! You have all outdone yourself! What a fun thing to do together as a family. 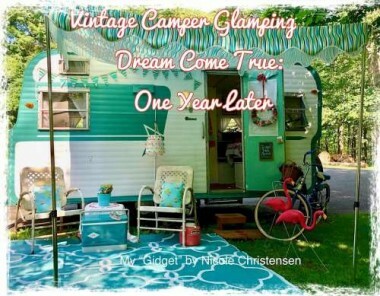 She’s truly a blast from the past… Being a child of the 60’s I felt like I was stepping back in time… So many memories of everything retro… It’s so great to see you able to enjoy the fruits of your labor of love… Happy Camping! I absolutely LOVE what you did with your “Home on the road”! We just purchased a 1983 Prowler, and I’m not sure if that qualifies, but I’m going to give it a shot at making it look as ventage as possible. (Just have to look up what went good for that year). And you’re an inspiration to me! Love ❤️ your beautiful trailer!! Such a great job. I just love the camper! Your not to shabby yourself. 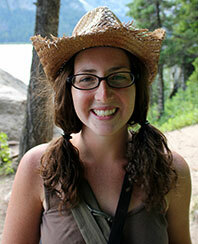 Thank you for taking me along on my virtual Glamping trip. 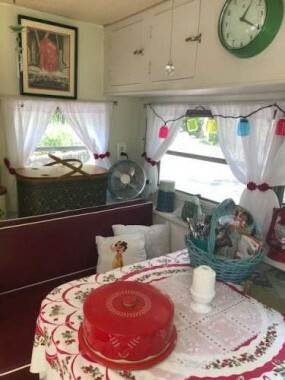 I still dream of having my own red and white vintage trailer someday. Love the vintage linens too.